With school beginning, its a good idea to review the laws pertaining to school buses. Also, keep an eye out as excited students return to their classrooms. Whether they are riding the bus, walking or on their bikes, keeping children safe should be everyones concern. The information below is from the Oregon Department of Motor Vehicle Handbook. 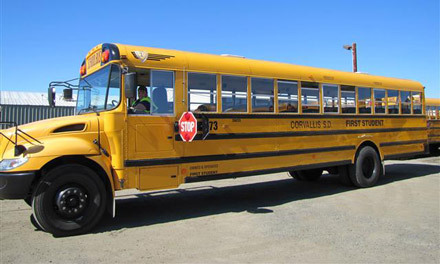 Oregon school buses have flashing amber and flashing red lights near the top of the bus on the front and rear. School buses are also equipped with a stop arm that extends out from the left side of the bus near the driver's window. The stop arm will be extended when the red lights begin to flash. School bus drivers turn on flashing amber lights to warn other traffic that the bus is about to stop on the road to load or unload children. You should get ready to stop. When the red lights begin to flash, this means drivers meeting or overtaking the bus from either direction must stop before reaching the bus. You must remain stopped until the bus driver turns off the flashing red lights. The school bus stop law applies on any roadway with two or more lanes of traffic. There is one exception to the law. If you are on a divided highway with two roads separated by an unpaved median strip or barrier, you must stop only if you are on the same side of the road as the bus. A painted median strip or a center lane used only for left turns does NOT create two separate roads. Where this situation exists, ALL lanes of traffic must stop. School bus drivers may report vehicles that improperly pass school buses. The report may be forwarded to the local law enformcement agency for investigation. All school buses and some school activity vehicles must stop at railroad crossings. The driver must open the bus door and be sure the tracks are clear before proceeding.